In this morning's Washington Post, on page A9, the Fox News Channel took out a full-page ad, chest-thumping about its coverage of this past weekend's Tea Party protests in Washington, DC (which were heavily promoted by Fox News). "How did, ABC, CBS, NBC, MSNBC, and CNN miss this story?" the text reads. It makes one wonder: Did Fox's marketing department bother to check on its competitors' coverage before they made these claims? 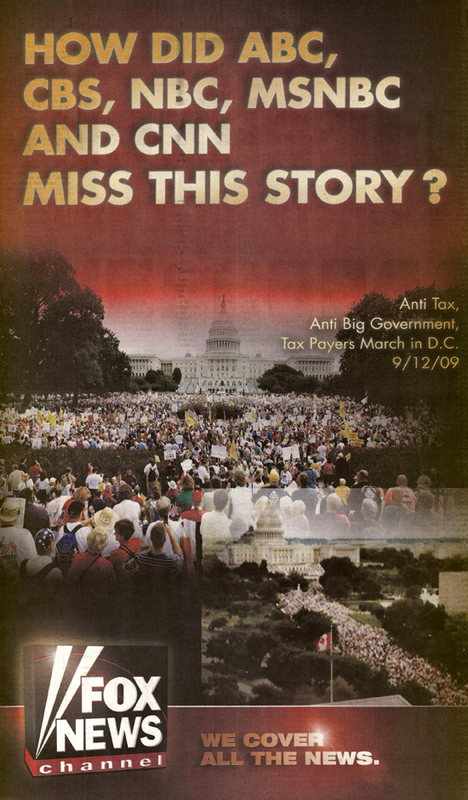 In the local DC market, the Tea Parties also received coverage. CBS reported on the story during the six-o'clock and eleven-o'clock news broadcasts, NBC did the same during its six-o'clock and seven-o'clock broadcasts and ABC covered the Tea Parties in all three evening broadcasts. No one missed the story. Conservative activists, who organized a march on the U.S. Capitol today in protest of the Obama administration's health care agenda and government spending, erroneously attributed reports on the size of the crowds to ABC News. Matt Kibbe, president of FreedomWorks, the group that organized the event, said on stage at the rally Saturday that ABC News was reporting that 1 million to 1.5 million people were in attendance. At no time did ABC News, or its affiliates, report a number anywhere near as large. ABCNews.com reported an approximate figure of 60,000 to 70,000 protesters, attributed to the Washington, D.C. fire department. In its reports, ABC News Radio described the crowd as "tens of thousands." 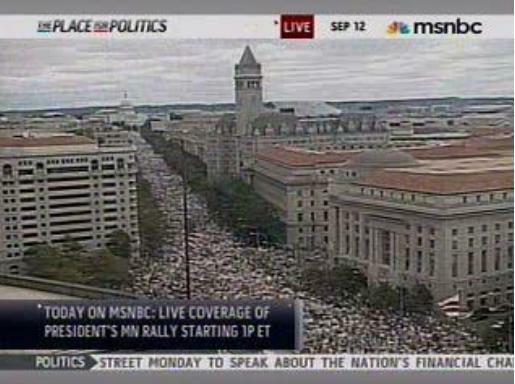 "From the stage I cited ABC news estimating the crowd at the March on Washington at 1.5 million. I also said "with all due respect to our friends in mainstream media, we need our own independent head count. Trust but verify." With a dead IPhone, I had been shown tweets from a number of different folks behind the stage citing the ABC estimate. They didn't say it. I regret misrepresenting the network, as their coverage that day was fair and honest." Seems to me that it was someone in Fox News' Marketing Department who missed the story. Again, all of this takes mere seconds to look up. So it's hard to understand why Fox has an ad wondering "How did, ABC, CBS, NBC, MSNBC, and CNN miss this story?" Unless by "miss," they meant to say: "not spend several hours fellating."